Winter is soup weather, and nothing warms the soul like a hearty stew accompanied by dense, fresh-baked bread. This particular beef- and onion-forward stew is something I picked up from my dad many years ago and have tweaked slightly with each batch. Surprisingly, it originates from the South Beach Diet Cookbook, offering a lower-carb alternative to most varieties that are chock full of potatoes. It’s easy to double and is perfect for preparation on a Sunday afternoon when you want to finish out the weekend by smelling up the entire house with deliciousness. And, like most stews, it ages well. In a gallon-sized zip-top plastic bag, combine flour, 1 teaspoon of chili powder, and salt. Pat beef dry with paper towels, add to bag, seal, and toss to coat well. Heat the olive oil in a 6- to 8-quart stock pot or dutch oven over medium-high heat until shimmering. 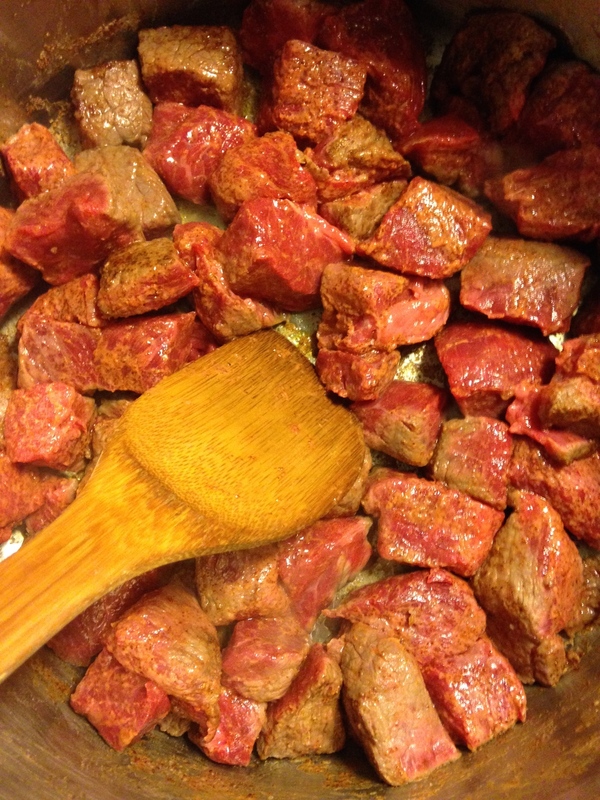 Add the beef and cook, stirring occasionally, until thoroughly browned on all sides (7–10 minutes). Add the onions, garlic, and oregano. Reduce the heat to medium and cook, stirring frequently, until the onions start to turn translucent (about 5 minutes). Add the broth, tomatoes (with juice), red pepper flakes, and the remaining 2 teaspoons chili powder. Stir to combine and heat until just simmering but not boiling. I peeled these potatoes absentmindedly, but leaving the skin on lends an earthier taste. Add the potatoes and carrots, bring back to a simmer, then cover and simmer for 30–40 minutes longer until the vegetables are tender. Salt to taste and lightly mash the potatoes to thicken the broth, then serve in bowls with a few slices of dense bread, preferably nestled in front of your fireplace. Pre-cut stew meat from the butcher counter is often too small and may come from any part of the animal. It’s always better to buy a chuck roast, trim the excess fat, and cube the meat yourself. Buy a slightly larger roast than you need to account for the trimmings. According to The New Best Recipe (my go-to cooking bible), stewed beef is best kept from reaching boiling temperature (212 degrees), so it should only ever simmer in the pot. Avoid chili powder blend, which incorporates other spices and salt and is usually cheaper. Go for the pure stuff! When doubling this recipe, be sure to use an 8- or 10-quart pot and brown the beef in two batches. If you’re a spice wimp, you can halve the red pepper flakes and serve the stew with a dollop of sour cream on top.